Tom Hardy is dedicating his final instalment of Bedtime Stories (cue heartbreak) to his dog Woody who died earlier this year. A lot of people are looking forward to seeing Tom because of his reading skills, obviously, which conveniently airs on National Dog Day on August 26th – and he will be reading ‘Fleabag’, by Helen Stephens. In a heartbreaking message on the Tom Hardy Dot Org Tumblr page, Tom revealed Woody had died after a ‘very hard and short’ six month battle with polymyositis, an inflammatory muscle disorder. Hardy’s next and final appearance on the show was filmed before Woody’s death back in June, and sees the adorable pooch appearing by Tom’s side, as he has in previous Bedtime Stories. Let’s have a little look at what people have been saying about Tom’s Bedtime Stories shall we? How comes I never heard about the bedtime stories from Tom Hardy ? ? 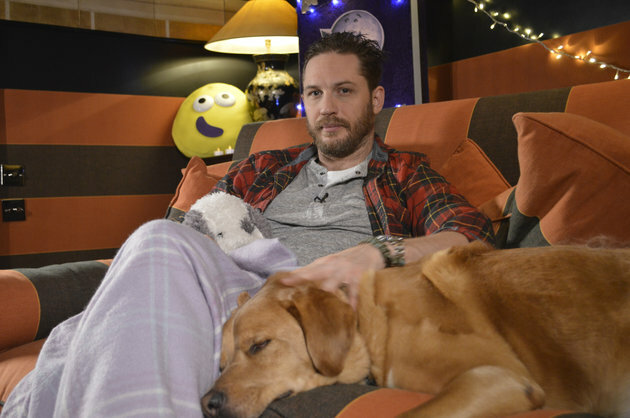 I'm going to start watching cbeebies bedtime stories purely for Tom Hardy ? The only time you'll catch me watching Cbeebies is when tom hardy does the bedtime stories ????? Could I love Tom Hardy reading the CBeebies Bedtime Stories any more? No. No I couldn't. The best. Friend over for dinner – currently you tubing Tom Hardy's CBeebies bedtime stories. Because we're adults ? So yeah, tune in – Cbeebies, Saturday August 26th.